Rhododendron is a large genus of flowering plants. It includes 1,024 species of woody plants in the heath family (Ericaceae). Some are evergreen, and some are deciduous. They are found mainly in Asia. Most of them have quite showy flowers. What gardeners know as Azalea is in fact a kind of rhododendron. 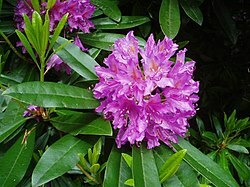 Many people have rhododendrons in their garden or flower pot. It is the national flower of Nepal. One rhododendron, Rhododendron ponticum, has become an Invasive species in North America. This page was last changed on 31 August 2016, at 18:10.